According to Brooks, the Yiddish word haimish suggests “warmth, domesticity, and unpretentious conviviality.” It is the feeling you have at holiday time when sipping wine, telling stories, and laughing for the thousandth time at Uncle Louie’s bad jokes. It is the emotions that wash over you when sharing good food and good times with close friends. It is the comfort you sense when you are someplace friendly and familiar. Finally, and the reason I want you to read this article, it is the experience you have when you go on a working vacation and become part of a neighborhood, community, and country. I have the same feelings when traveling. When I am on a working vacation I do not simply go to famous sights–museums, churches, galleries–but also try to become an integral part of the local culture. I make friends, meet neighbors, shop at area merchants, and attend social, cultural, and religious events. I travel to important locales as well as “off the beaten path” places tourists rarely see but give a deeper appreciation for a country’s soul–like a foreign visitor attending a State Fair. Like my times spent with friends and family, these working vacations were warm, friendly, and convivial. Brooks finishes his column with some wonderful advice: “Buy experiences instead of things; Buy many small pleasures instead of a few big ones.” This is one of the best arguments I can think of for taking a working vacation–it is truly an experience you will never forget. In summer, 2004, my wife and I were living in Nepal where I was teaching at the University of Kathmandu under the auspices of a Fulbright Grant, i.e., on the other guy’s dime! When classes were finished I still had a few weeks before returning to Minnesota and still had a few thousand dollars remaining in my travel account. 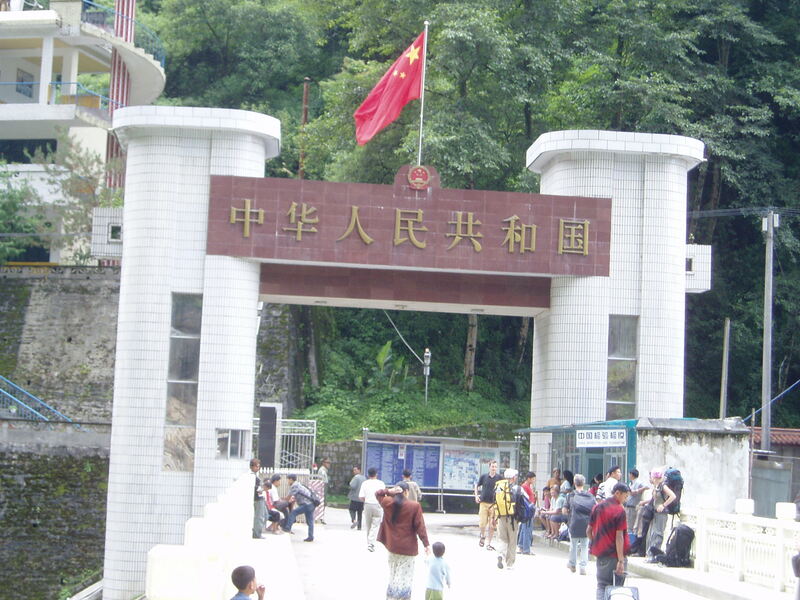 We decided to spend our remaining time and money traveling to Tibet. However, rather than the traditional round trip flight and packaged tour, we decided to rent a car and drive to Lhasa via the 900 km Friendship Highway–the second highest automobile road in the world and surely one of the most breathtakingly beautiful drives on the planet. 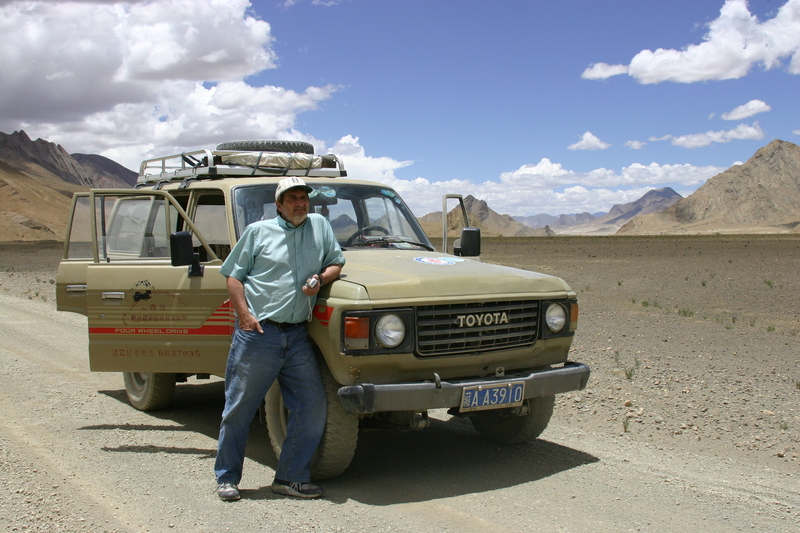 We took a local bus from Kathmandu to the border, walked across the Zhangmu Bridge into Tibet, and picked up our vehicle, an old Toyota Land Cruiser, along with a Chinese driver who spoke no English except for “OK, no problem,” usually uttered just after the tires came within inches of a sheer mountain precipice. However, a running narration was not really necessary as the scenery outside the car window spoke for itself. During our four days on the road we stopped in traditional villages, met some locals, shopped for meals in Tibetan fruit and vegetable markets, shared those meals with yak herders, and visited Buddhist monasteries allowed by Chinese officials to remain open. Our drive to the Tibetan capital was certainly the highlight of our stay in Tibet, especially after arriving in Lhasa and discovering that it looked much more like an ordinary Chinese regional capital than the mysterious “Forbidden City” of classical literature. After leaving the lush green Nepalese countryside the Friendship Highway climbs steeply to reach the 12,000 foot Tibetan plateau. 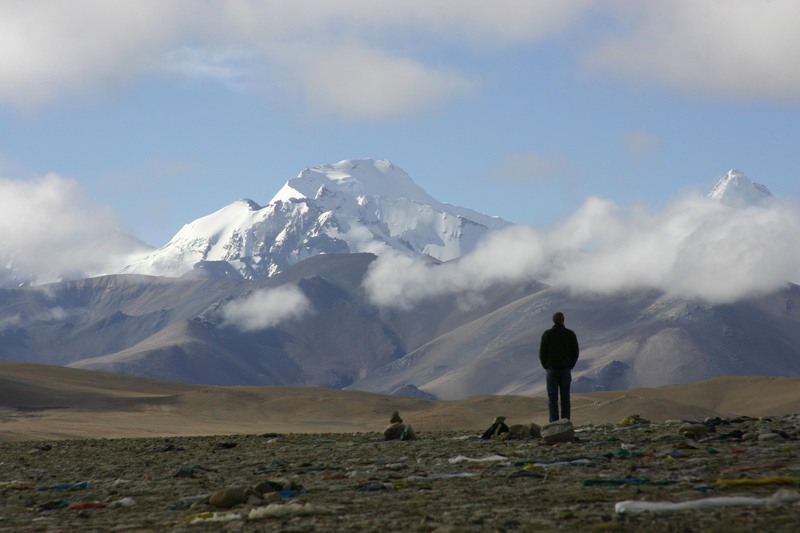 It passes glaciers, some reaching to the shoulder of the road, as well as five of the world’s highest peaks, clearly visible in the clear, dry Tibetan sky: #1: Everest (29,029), #4: Lhotse (27,940), #5: Makalu (27,838), #6: Cho Oyu (26,864), and #14: Shishapangma (26,335). The road reaches its highest point at the Gyatsola Pass, 5220 meters, or about 17, 130 feet, the second highest automobile pass in the world. 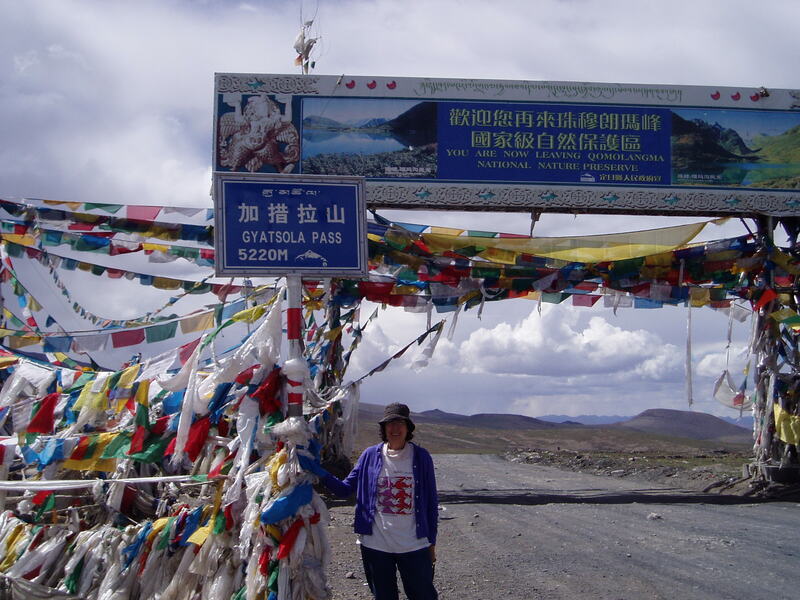 Ruthie at the Gyatsola Pass at an Elevation of 17,130 ft. Although we never experienced altitude sickness, it is hard to describe how difficult it is to function at that extreme elevation, only 400 feet lower than the Everest base camp! You would walk a couple of steps and then need to rest. The process of bending down to pick up something you dropped would send your heart racing and require a significant pause. The mountain scenery at Gyatsola is truly spectacular, but sometimes you can be so short of breath that it can be difficult to tell your traveling companions how much fun you are having! 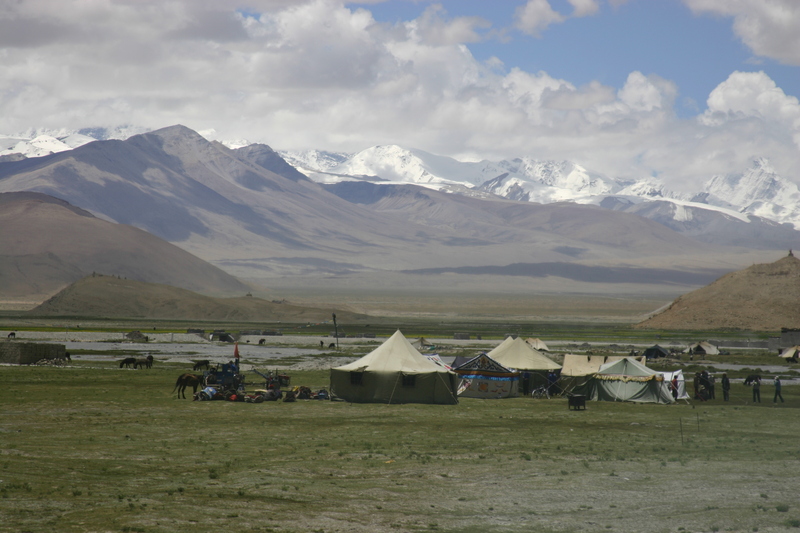 After Gyatsola, the road, unpaved and without guard rails or other safety features, passes through farms and small villages where residents still follow a traditional nomadic life style–herding yaks and goats, living in yurts, and moving with the seasons. 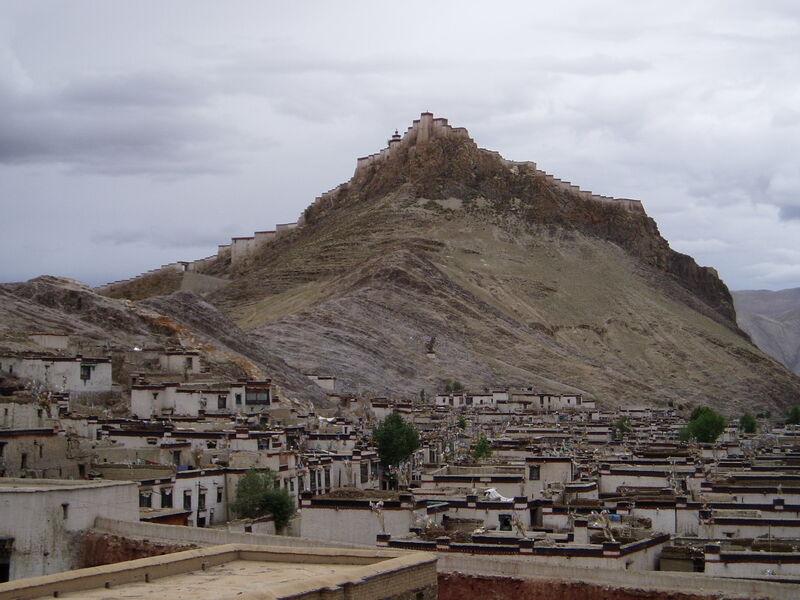 The road also passes the two historically important cities of Gyantse, site of the massive Gyantse Fortress built in 1390, and Shigatse, home of the Panchen Lama, the second highest ranking religious leader in Tibetan Buddhism after the Dalai Lama. Finally, after four exhausting but exhilarating days, we arrived in Lhasa. And while there are certainly wonderful things to see and do there–the Potala Palace, Jokhang Temple–our minds kept returning to those extraordinary days along the Friendship Highway and the time we spent seeing, enjoying, and sharing the “real” Tibet. If you will be traveling to Nepal in the near future and have the time for a truly unique side trip, the four-day drive to Lhasa along the Friendship Highway is something that, I guarantee, you will not soon forget.